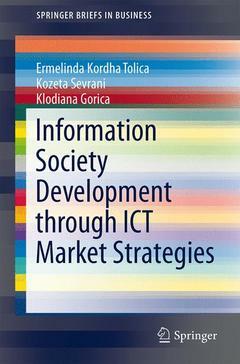 Introduction.- Information Society and the Efforts for an ICT Strategy.- ICT Sector and the Importance of ICT Infrastructure Management.- Information Society and ICT Sector in Albania, (Secondary Data).- A Theoretical Model For ICT Driven Development, Factors Affecting ICT Market.- Albanian Situation on the Relationship of Factors for ICT Market Development.- Conclusions and Recommendations. Anex 1. Anex 2. Ermelinda Kordha is an Associate Professor of Management Information Systems and a part of the Faculty of Economics at the University of Vlora, Albania. Dr. Kordha has been a participant in a number of national and international conferences and has published her work in several national and international journals. She has also been an organizer of scientific activities in the university. Kozeta Sevrani is a Professor of CS and MIS and Head of the Department of Mathematics, Statistics and Applied Informatics at University of Tirana, Albania. Her research interests include: digital divide; issues and solutions in building information infrastructure, e-business, e-learning, e-services and e-government in developing countries, particularly in Albania. She does an extended work in consulting private companies and government agencies in Albania. Klodiana Gorica is an Associate Professor of Marketing and Tourism at the University of Tirana, Albania.